Palestinian Minister Dies In West Bank Protest Against Israel : The Two-Way The circumstances surrounding Ziad Abu Ein's death are unclear. Medics say he died from exposure to tear gas. Israel said it will examine his body jointly with Jordanian and Palestinian pathologists. An Israeli soldier pushes Palestinian Cabinet member Ziad Abu Ain (left) during a protest in the village of Turmus Aya near the West Bank city of Ramallah, on Wednesday. Abu Ain died shortly after the protest in which witnesses said Israeli troops fired tear gas at him and dozens of Palestinians marchers. Witnesses also said Abu Ain was beaten by an Israeli soldier. A Palestinian minister died today following a protest against land confiscations in the West Bank. But it's unclear what caused Ziad Abu Ain's death. Palestinian medics say he died from exposure to tear gas. Some witnesses say he was hit and shoved by Israeli soldiers; others said he was hit in the chest by a tear gas canister. Linda Gradstein, reporting on the story for NPR's Newscast Unit, says, "There had been clashes in the area for several hours between Palestinians and Jewish settlers. 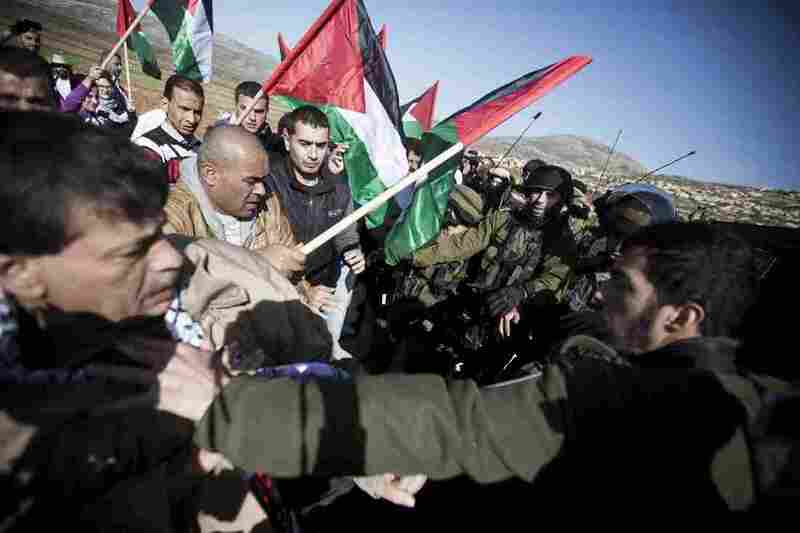 Abu Ain collapsed and was taken to a nearby Palestinian hospital, where he died." Israel said it was investigating the circumstances that led to his death. The Israel Defense Forces said that Israeli, Palestinian and Jordanian pathologists will conduct a joint examination of Abu Ain's body. Abu Ain, 55, a minister without portfolio, was among dozens of protesters, both Palestinian and foreign, who had gone to plant olive trees on land they believed Israelis would confiscate in the village of Turmus Aya, north of Ramallah, near the Jewish settlement of Shiloh. Palestinian President Mahmoud Abbas called Abu Ain's death an "intolerable barbaric act that cannot be tolerated nor accepted." His comments were reported by the official Palestinian Wafa news agency. He called for three days of mourning. Wafa reported that Abu Ain was a member of Fatah's Revolutionary Council and the head of the Palestinian Authority's committee that opposes settlements and Israel's barrier. He had spent many years in Israeli prisons. The news agency said he was arrested in the U.S. in 1979 and extradited to Israel where he was sentenced to life in prison. He was released in a prisoner swap in 1985. The Associated Press reported that Abu Ain spent a year in administrative detention — without trial or charges — during the second Palestinian intifada. His death comes amid simmering tensions between Israel and the Palestinians.